I'm not sure how it would taste if you use pork instead of beef. But why not, if you like it? Pork belly or pork ribs...sounds not too bad. Really appreciate your effort to post those delicious recipes. I wish to cook something myself but I dont understand the terms of cooking. Like what is "拖水", "滾刀法", etc.? Does it mean boiling in water? But then, how long would it take to boil? Hope you may put into more details in the description so that the novice level person could follow too. Thanks so much! 拖水 is blanching. 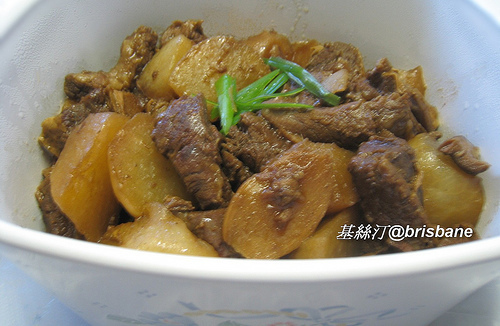 Place the meat in boiling water for a few minutes in order to remove any impurities and blood. 滾刀法 is a kind of cutting method, quite similar to slicing 切片. 滾刀 is to be used to cut veggies into chunks diagonally, then roll the veggie towards an angle, say 30 to 40 degrees, and cut diagonally again. Keep cutting and rolling the veggies, you'll end up with getting uneven veggie chunks beautifully. Im wondering where to buy 牛腩 in brisbane? Can you tell me where you buy it? I bought beef brisket from Asian butcher shops, at Sunnybank Plaza or Pinelands Plaza. Hi Christine, can you tell me how to add beef tendon into this dish. My whole family love beef tendon but I never know how to clean it and how to cook it. Thanks. Louise. Oh, that's easy. Just blanch the beef tendon for a few minutes in boiling water, then pop them in and cook with the beef brisket. Pick those young radish in season. They are sweet, not bitter. 如用牛腱,做法是否d same? 炆時間是否longer for 牛腱?